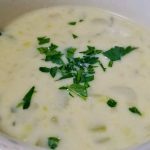 Creamy New England Clam Chowder, made better gluten free. Yes! Having grown up in the North East, I frequently crave a comforting bowl of chowder, New England style. However, finding gluten free chowder in my local eateries in the Pacific Northwest has proven impossible. When I can’t find it, I make it. And this recipe, is a home run. 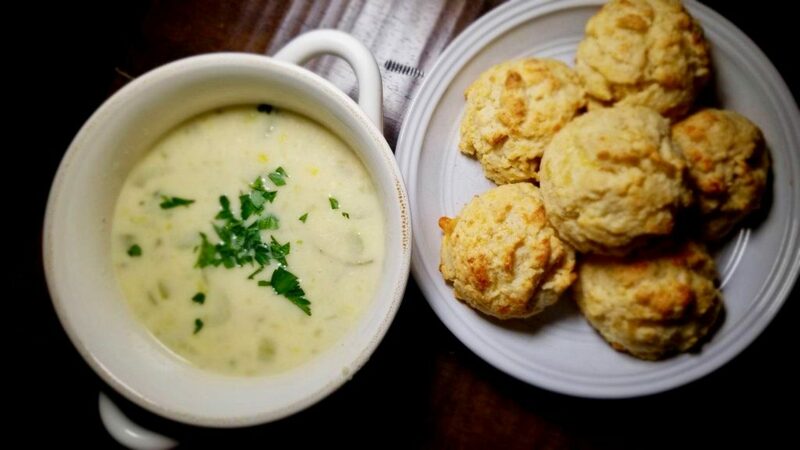 The best part of making clam chowder is the ease of cooking. If you choose to make it with fresh clams, the process may take longer, but fresh is always worth it. 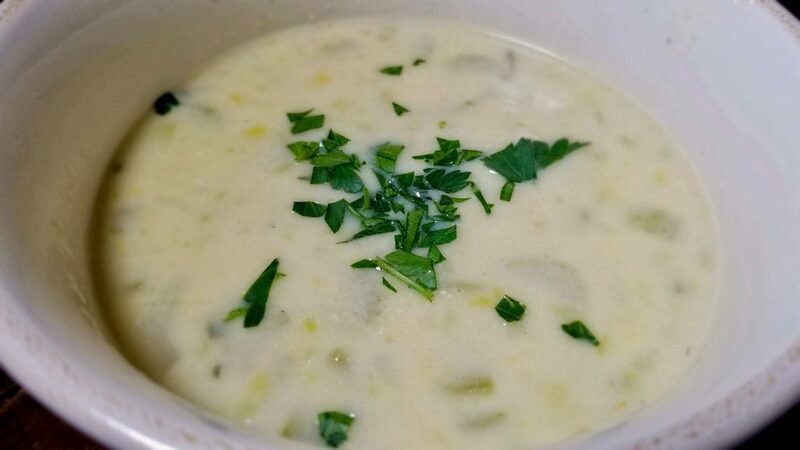 To make chowder with our recipe, you will need 2 1/2 cups of clam juice. 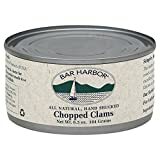 This is the approximate amount that you will have if you use 3- 6.5 oz cans of diced clams (we use Bar Harbor), plus one 8 oz jar of clam juice OR 5 lbs of fresh clams steamed in 3 cups of water. The directions for using fresh clams are in the “Notes” section of the recipe. In addition to clam juice, we add homemade vegetable or chicken stock – whichever we happen to have on hand. We also use leek instead of onion, fresh bay leaves, thyme, garlic and shallot. A cup of cream, 1/4 cup of Flour Farm flour, and potatoes provide the necessary, creamy comfort. Our recipe is not a goopy, gloppy, heavy chowder. If you desire a thicker consistency, add more flour by the tablespoon. Please reach out and leave a comment in the section provided below. We love to hear from you! An important note: this recipe successfully uses our Gluten Free Family Favorite Bread recipe and Flour Farm Organic Gluten Free Flour Blend. This blend is found online at Amazon.com, Azure Standard or in a few local grocery stores. If you choose to make this with another flour blend, please note that your results may differ. Step 1: Melt the butter, (or heat the oil,) in a large dutch oven or stock pot over medium-high heat. Step 2: Add the leek, celery, garlic, shallot and salt. Saute until vegetables are tender – about 10 minutes. Step 3: Add the potatoes and flour. Stir frequently and cook for two minutes. Step 4: Slowly pour in the broth and clam juice – stirring briskly as you add the liquid to avoid lumps. Add the bay leaves and fresh thyme. Bring to a boil and reduce heat to simmer for about 15-20 minutes. Potatoes should be tender, but not mushy. Step 5: Remove bay leaves and thyme sprigs from chowder. Use an immersion blender for about 3 pulses to blend a bit of potatoes into the chowder. Alternatively, scoop out about 1-2 cups of chowder and blend separately. Return the liquid to the chowder. Step 6: Add cream and clams to the chowder. Stir and simmer for 2-3 minutes. Season to taste with salt and pepper. Step 7: Ladle hot chowder into bowls and garnish with chopped parsley. Serve immediately. Bacon: This recipe does not contain bacon. If bacon is a must have in your chowder, begin by cooking four slices of your favorite bacon in the pot and use the grease instead of butter. Remove the cooked bacon, chop and set aside. Add the bacon with the clams or use as a garnish. Fresh Clams: If using fresh clams, you will need about 5 lbs of freshly scrubbed clams. Bring 3 cups of water or broth to a boil in a large dutch oven or stock pot (broth adds a richer flavor). Add clams, cover the pot and steam in the liquid for about 5 minutes. Stir clams and remove any opened shells to a separate bowl. Continue to simmer and remove clams as they open. After a few minutes, all clams should be open. The few that remain shut need to be discarded. Remove the pot from the heat, and strain liquid into a measuring cup. Separate clams from their shells and chop if necessary. Strain any remaining liquid and add to the liquid in the measuring cup. 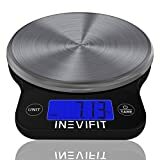 You should have about 2 1/2 cups (591 ml/20 fl oz). Special thanks to Carlsbad Cravings for how-to help. Nutrition information provided below is for the recipe as written using organic salted butter, unsalted chicken stock, and heavy cream. Each serving yields about 1.5 C (355 ml/12 fl oz).